LOCATION, LOCATION, LOCATION! 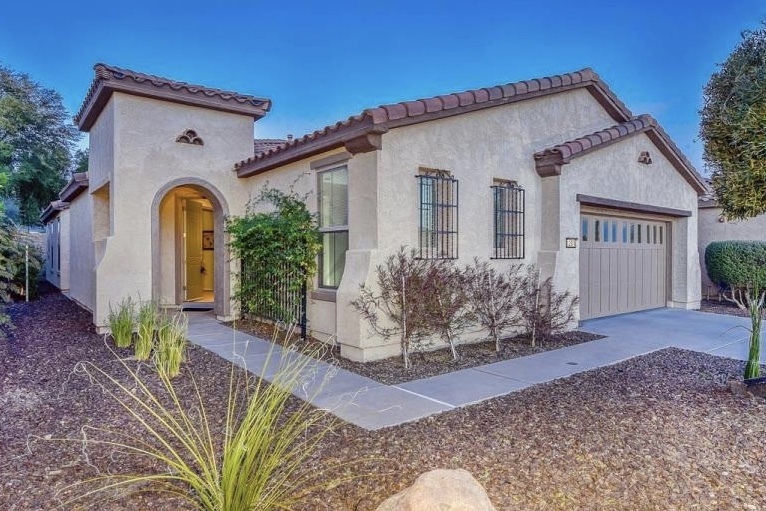 Close to the Kiva Club, this ”Solis” model is perfect for entertaining friends inside & out. Enjoy a cup of coffee or sip a glass of wine in the very private backyard. A large bay window invites you into a dream kitchen complete w/ granite slab countertops, stainless steel appliances, gas range, & pendant lighting over a large breakfast island. Keep cozy on cool winter evenings by the fireplace in the great room w/ its open media wall & slider to private courtyard. Large owners suite w/ en suite bathroom & three closets. Split guest bedroom & separate den. Tile on a diagonal in all the right places w/ upgraded carpet in the bedrooms. Trilogy at Vistancia is a 55+ active adult community w/ indoor & outdoor pools, spa, pickleball, bocce, tennis courts, & more!